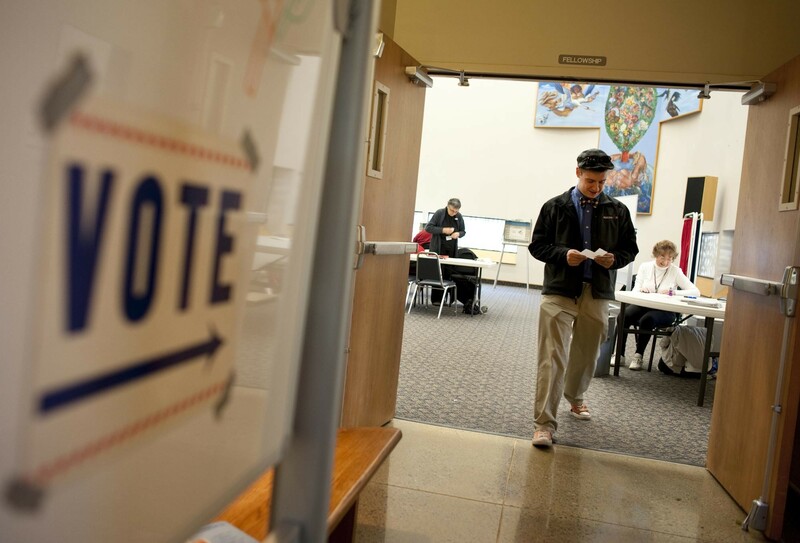 Welcome to the ELECTION DAY 2012 Photo Blog. 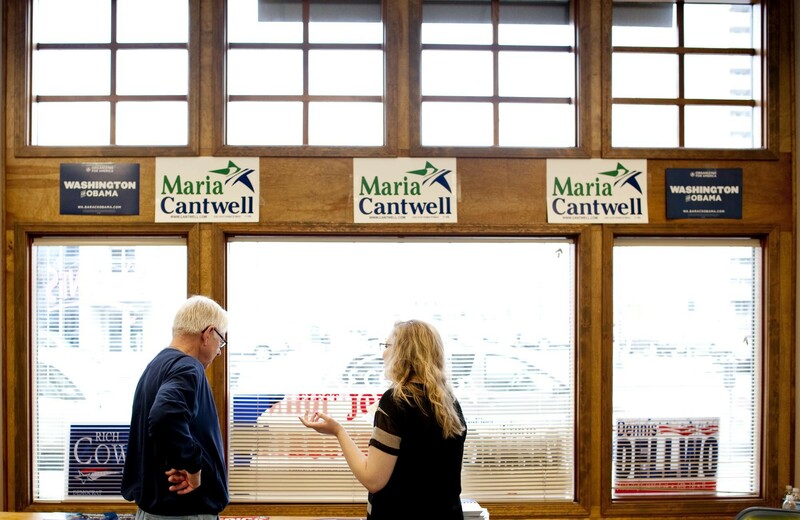 We'll be updating you all day with photos from the Inland Northwest — from the streets, polling stations, and party headquarters — capping off the night with election result reactions from Spokane watch parties. 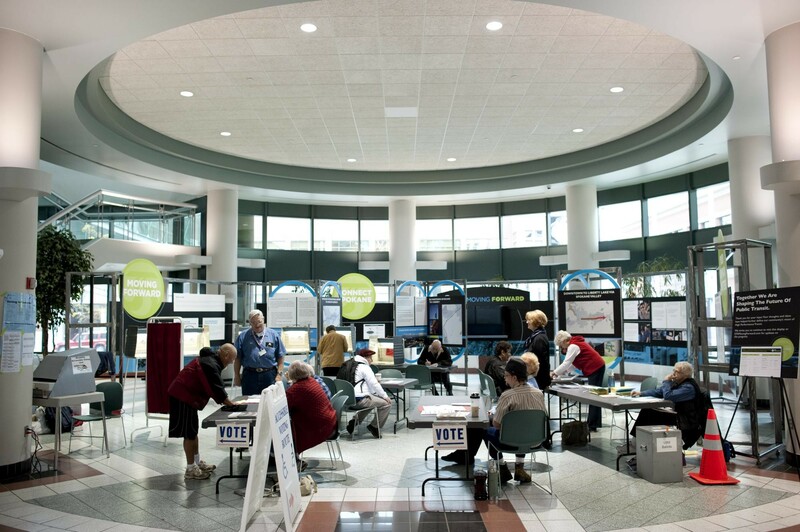 The STA building is one of the voting assistance and ballot drop box locations in Spokane. 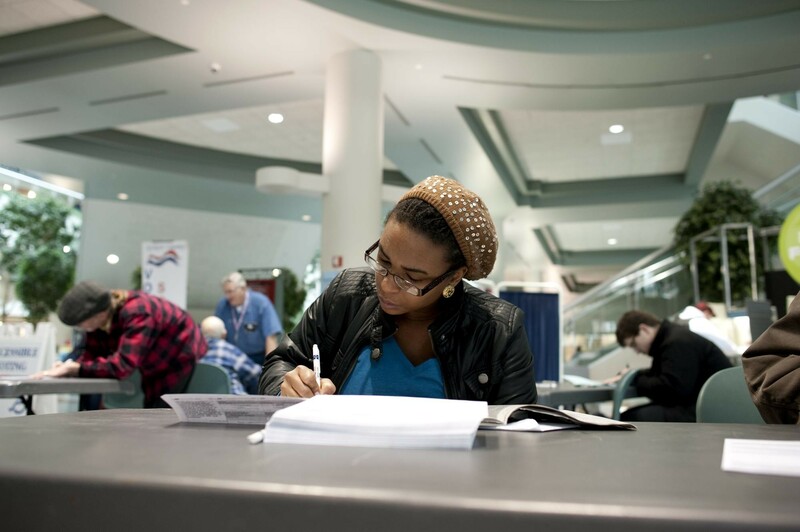 Rachena Webb, of Spokane, fills out her ballot at the STA building in downtown Spokane. 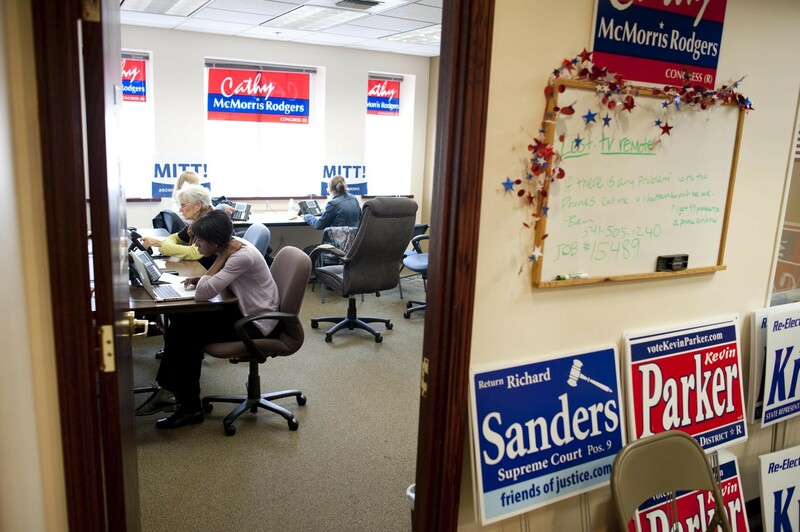 Volunteers at the Democratic HQ in Spokane talk the morning of the election. 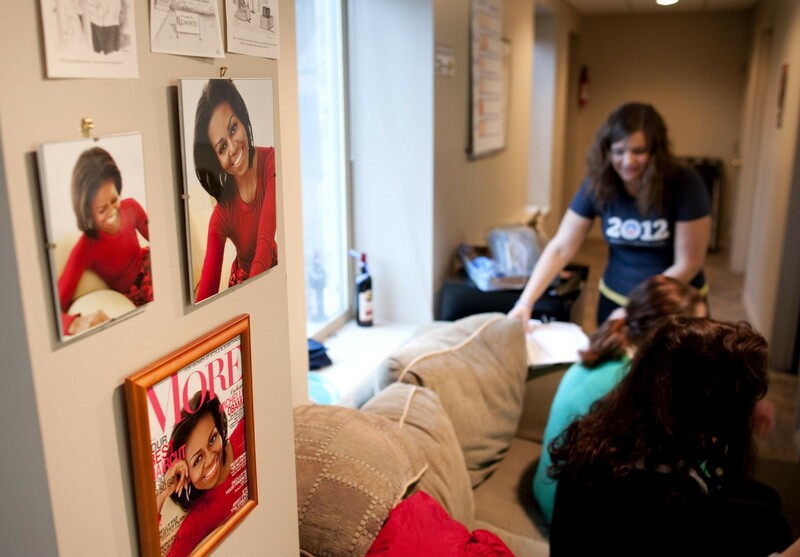 Volunteers at the Democratic HQ in Spokane hang out before dispersing for door-to-door rounds. 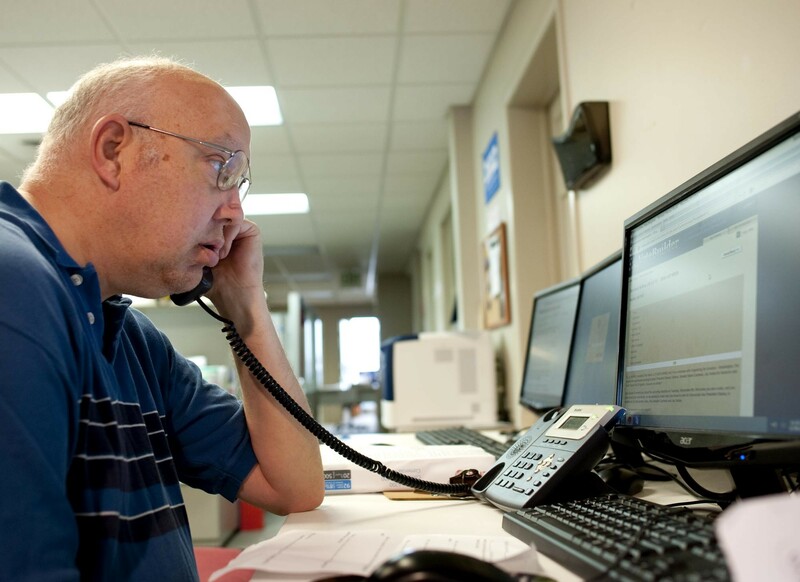 Greg Dault, a Spokane volunteer at the Democratic HQ, places a call to a potential voter. 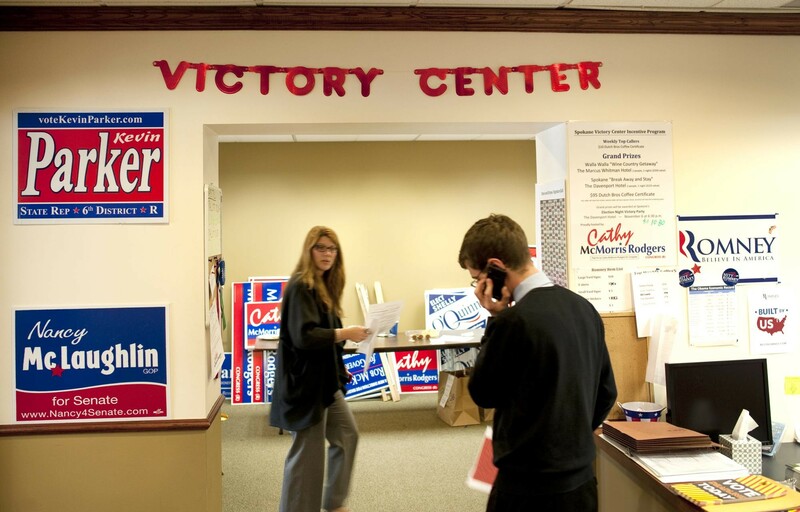 As of Sunday, Dault had contacted 20,921 area voters this election cycle. 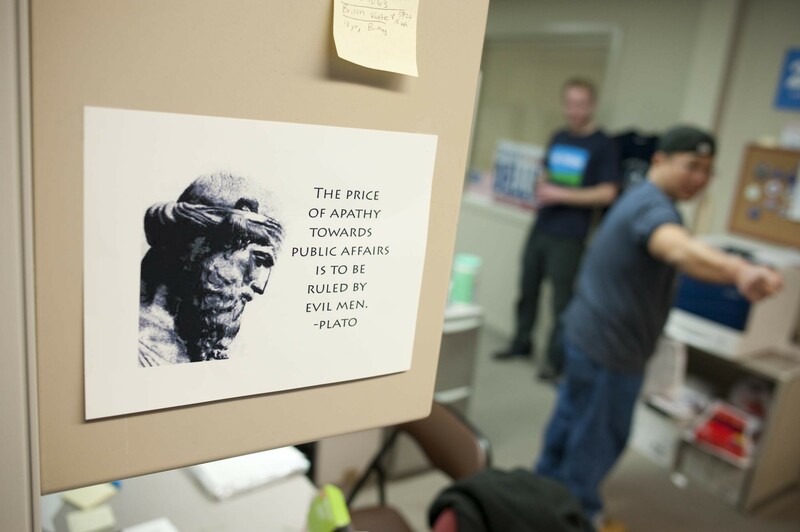 A flier hangs on a volunteer's cubicle at the Democratic HQ in Spokane. 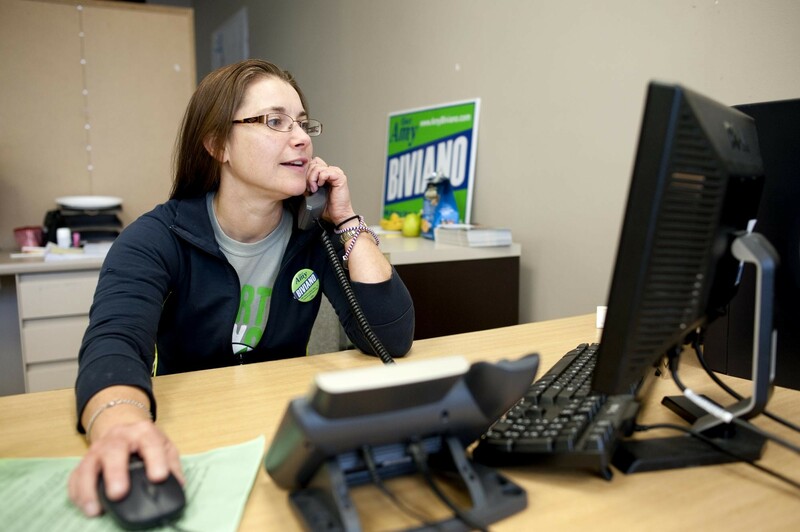 Amy Biviano makes last second calls to voters from the downtown Democratic HQ. 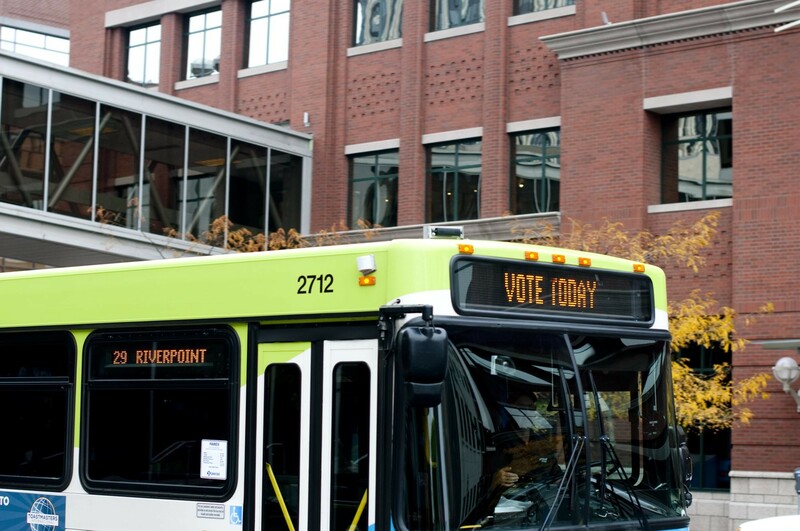 A bus in downtown Spokane. 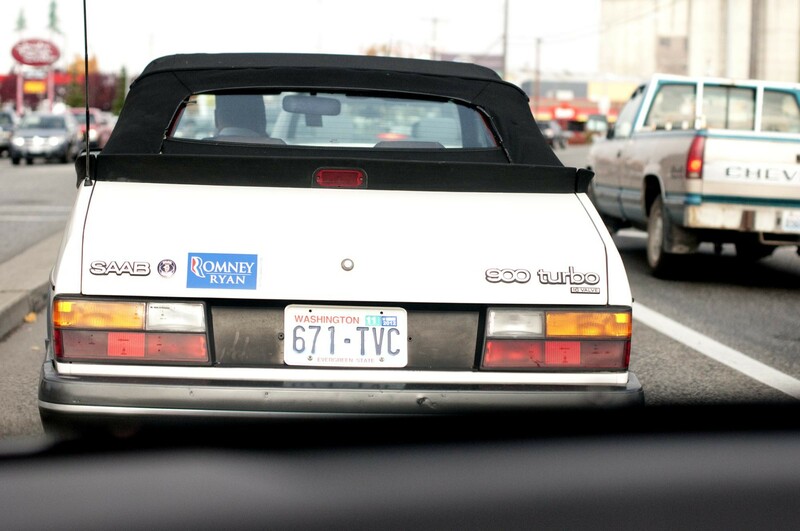 Bumper sticker driving northbound on Division. 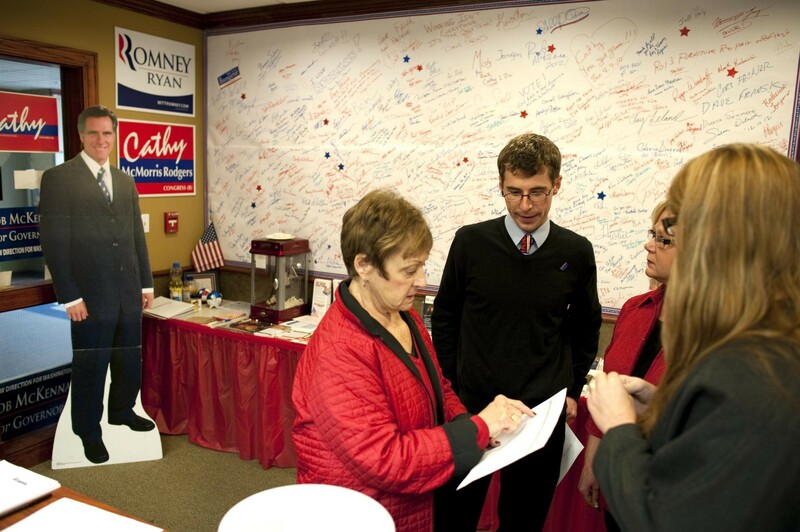 The GOP Victory Center HQ on North River Drive in Spokane. 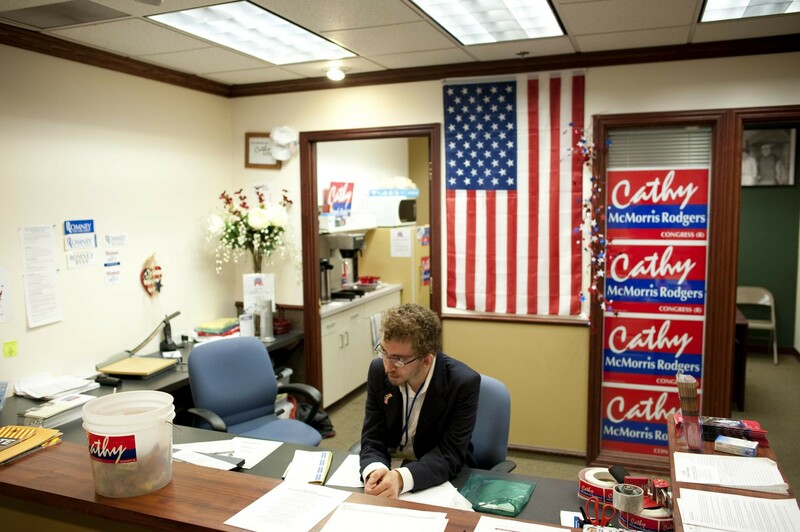 A volunteer mans the front desk at the GOP Victory Center HQ. 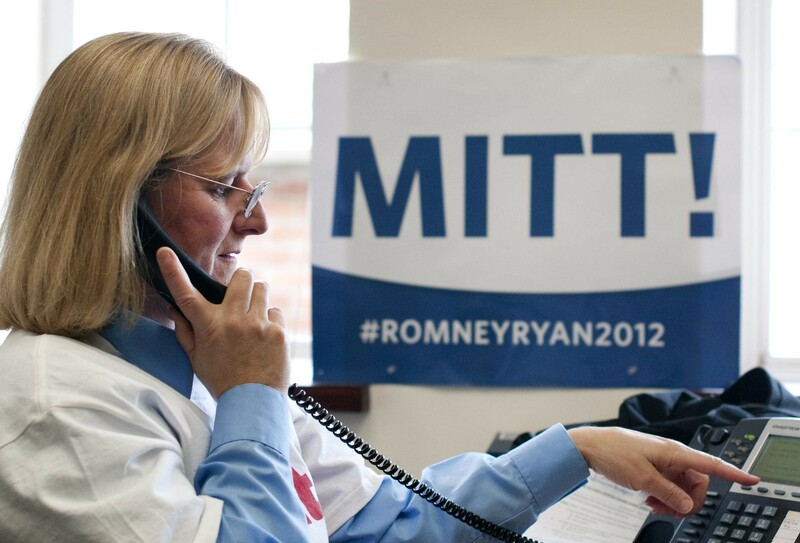 Volunteers call potential voters at the GOP Victory Center HQ in Spokane. 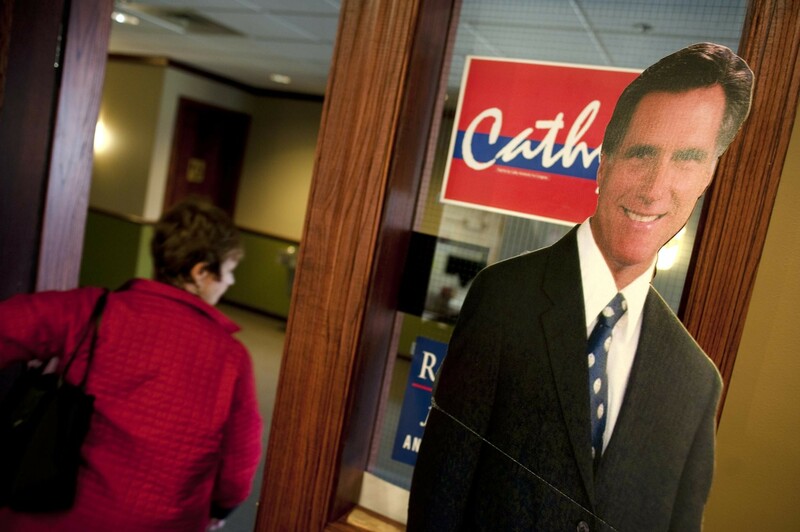 A volunteer leaves the GOP Victory Center HQ, saying "What a good looking guy," as she passes a life-size cutout of Mitt Romney. 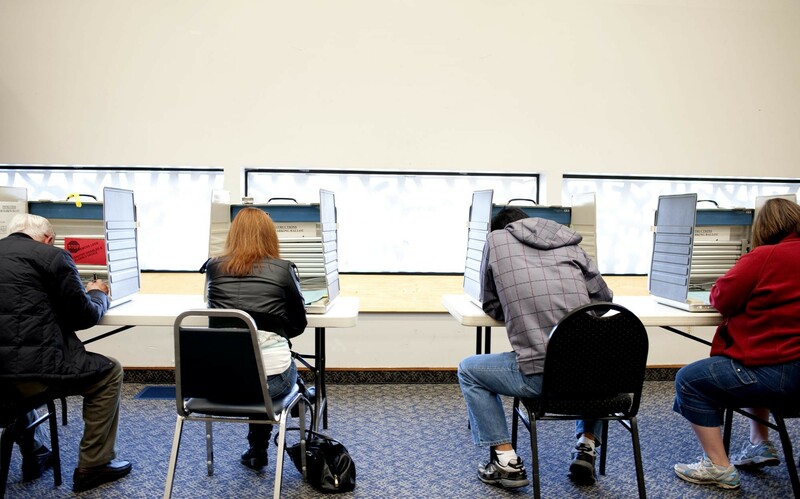 Voters fill out ballots at St. Mark's Lutheran Church on Grand Street in Spokane. 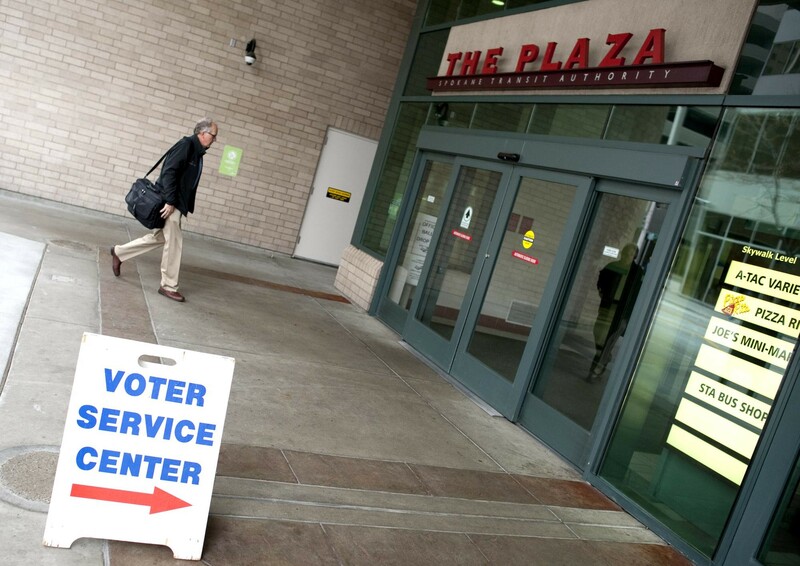 Brian Hoch, of Spokane, leaves the polling station at St. Mark's Lutheran Church after submitting his ballot. 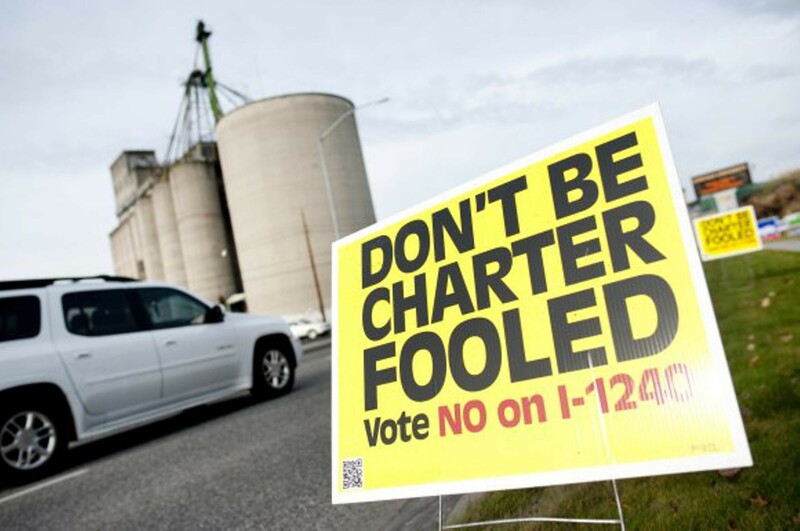 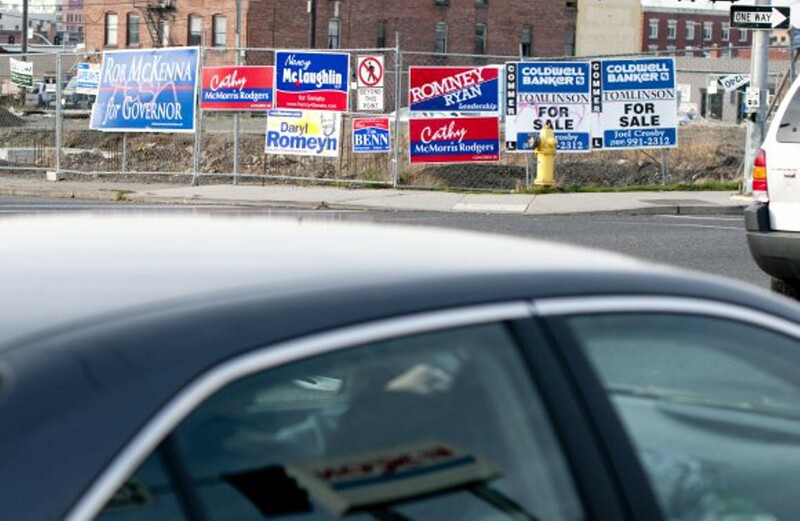 Campaign signs near Ruby and East Cataldo in Spokane. 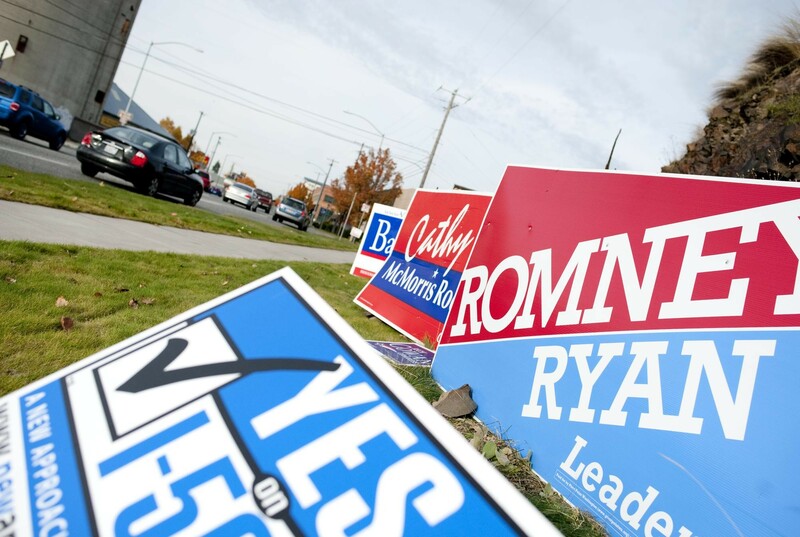 Campaign signs in victory formation near the intersection of Ruby and Boone in Spokane. 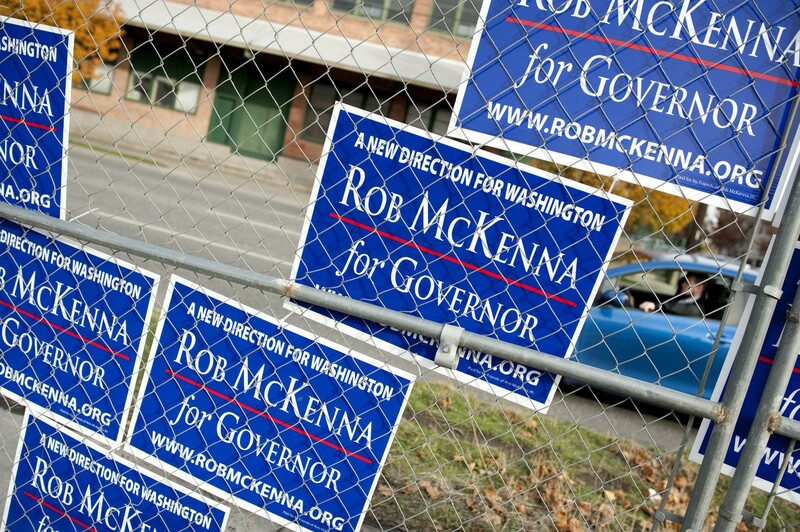 Signs littering the fence on Division and Third in Spokane. 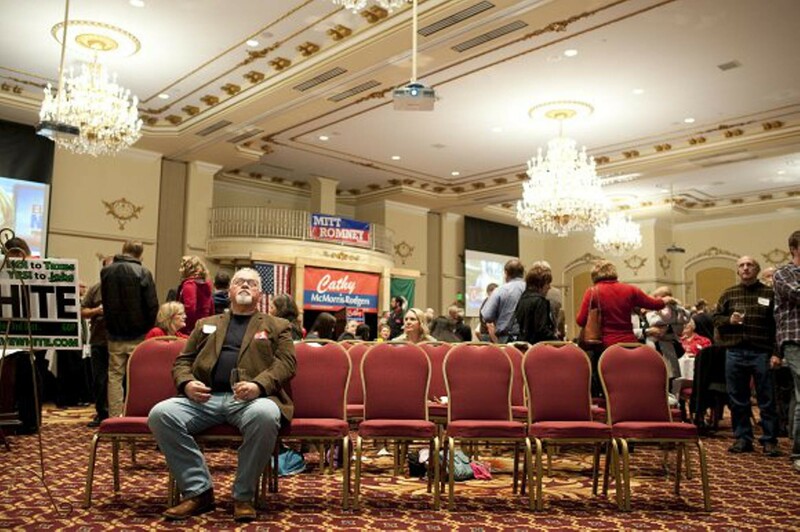 Robin Paullin watches the early election results come in at the Cathy McMorris-Rodgers watch party at the Davenport Hotel Tuesday evening. 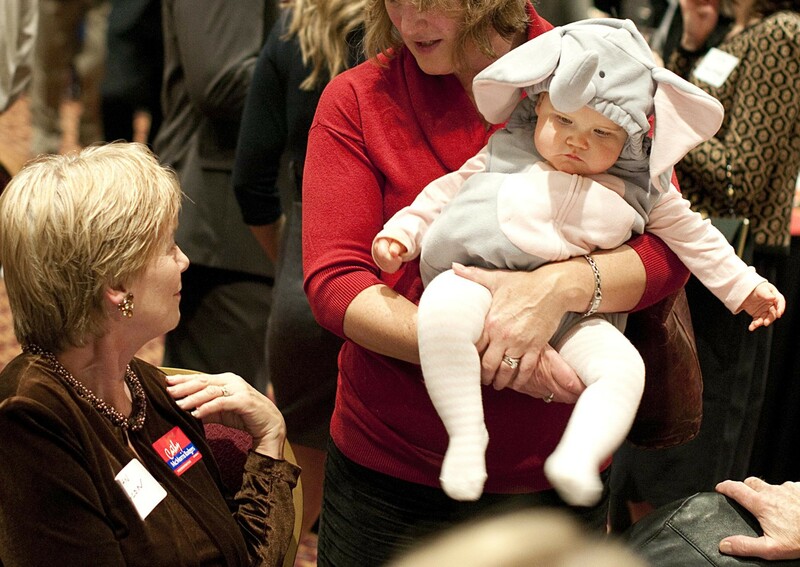 A GOP good luck charm at the Cathy McMorris-Rodgers watch party. 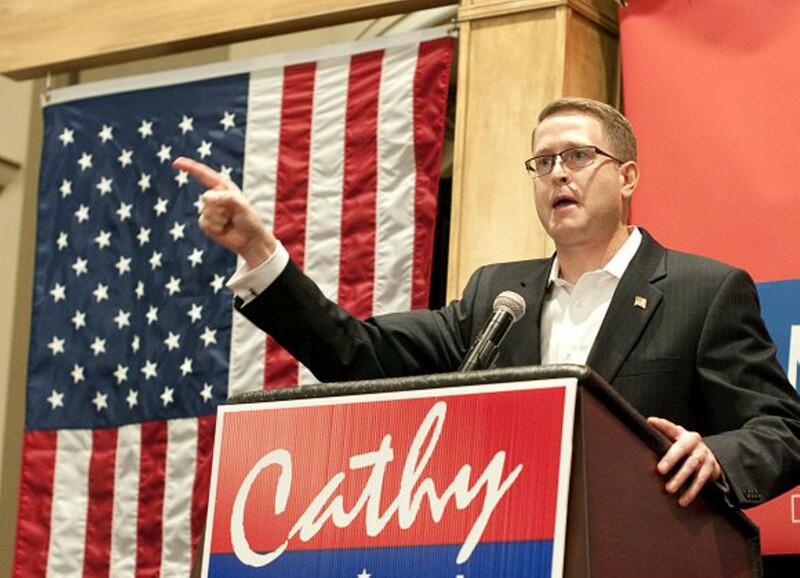 Matt Shea, a candidate for State Representative District 4, riles up the crowd with promises of aggressive contention with state Democrats. 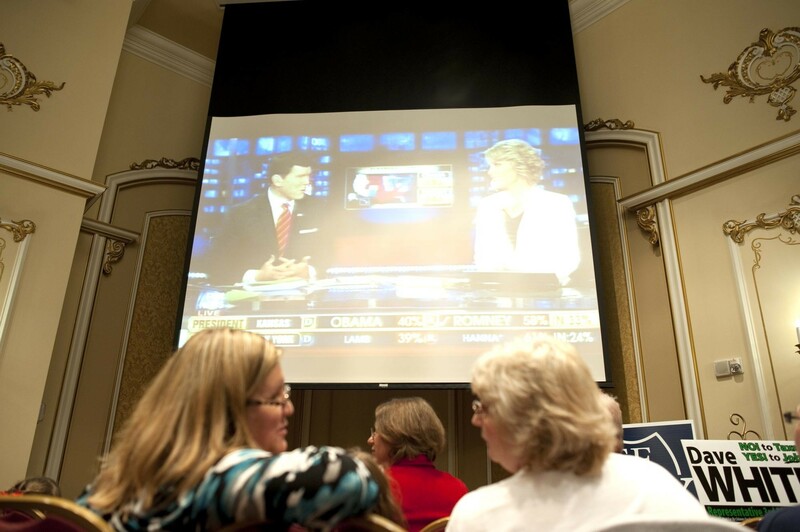 Attendees of the McMorris-Rodgers watch party at the Davenport Hotel watch the Fox News coverage of the election Tuesday evening. 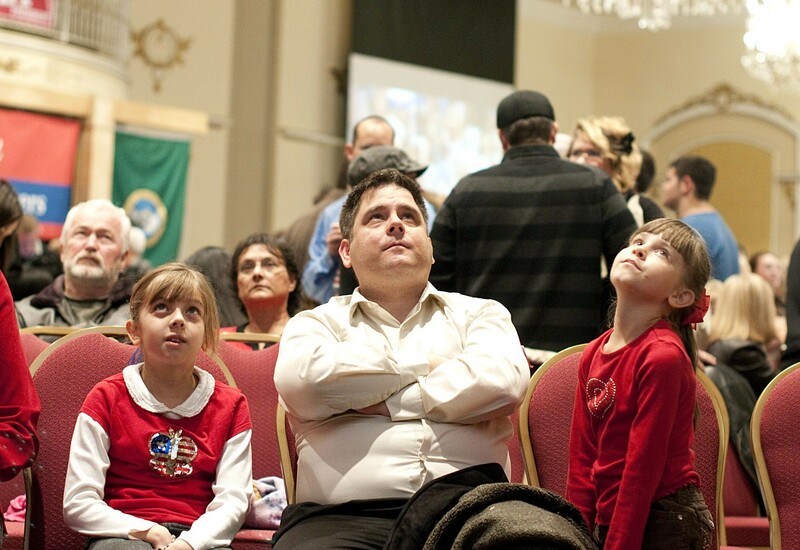 Tom Buck and his daughters Faith (left) and Hannah (right) react to the presidential election results at the McMorris-Rodgers watch party at the Davenport Hotel Tuesday evening. 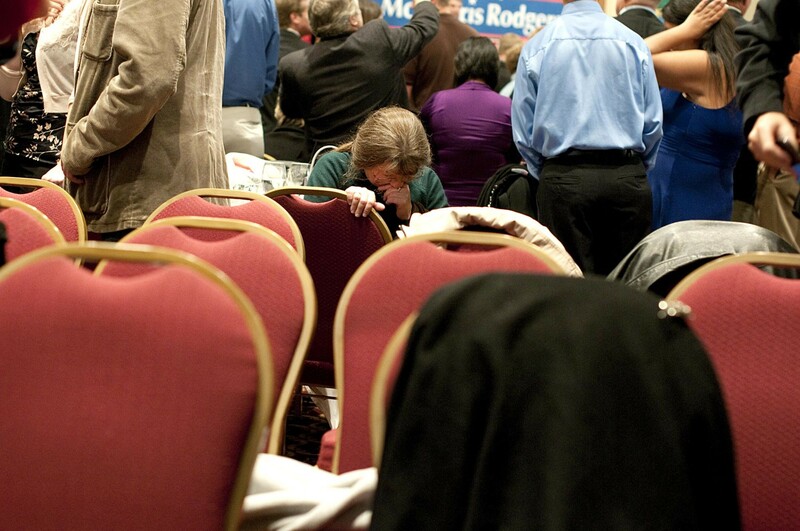 A woman takes a moment to compose herself after the news of an Obama re-election at the McMorris-Rodgers GOP watch party at the Davenport Hotel Tuesday evening.